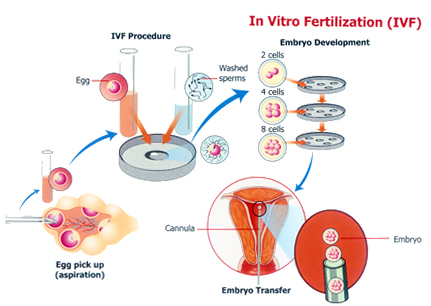 In vitro fertilization (IVF) is a fertility treatment in which an egg is manually fertilized by sperm outside the body, and is commonly used when other methods of assisted reproductive technology have failed. When IVF is successful, the procedure is combined with an embryo transfer, which involves physically placing the embryo in the uterus. In vitro fertilization can be done with a couple’s own eggs and sperm or with donor eggs, sperm or embryos if the woman is unable to produce healthy eggs or if the man is sterile. There are five main steps involved in IVF: monitoring and stimulating the development of healthy eggs in the ovaries; collecting the eggs; combining the eggs and sperm together to allow for fertilization and early embryo growth; and transferring the embryos into the uterus. In the early stages of IVF, fertility medications are prescribed to control the timing of the egg ripening, and to increase the chance of collecting multiple eggs during one cycle. Retrieving multiple eggs is necessary because some eggs will not develop or fertilize after they are collected. Opting for in vitro fertilization is a big decision for any couple, and choosing the right clinic is just as important. Our fertility specialists at GREFI provide IVF and other assisted reproductive technologies to couples throughout Puerto Rico. Contact our clinic today to discuss our array of fertility programs.